VICTORIA, BC – Vancouver Island beer blog Beer on the Rock reports that Victoria’s Canoe Brewpub will be launching a new beer next week with a special “Love a Farmer” event in support of the Victoria Downtown Public Market. A medley of fruit aromas and flavours, complimented by a rich Belgian malt character, Canoe’s Golden Lion Belgian Ale is a smooth, off-dry session ale – our tribute to the exquisite beers of the Belgian tradition. 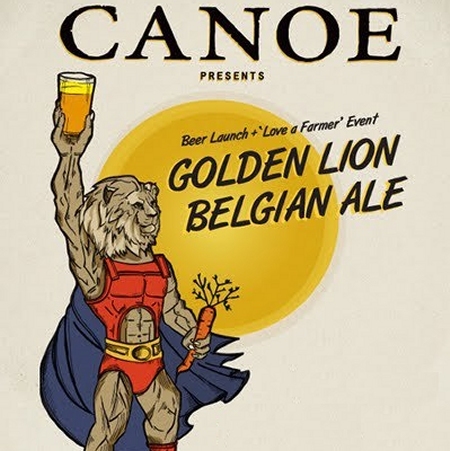 Golden Lion will be unveiled next Wednesday March 14th with a tasting at the Canoe Brewpub (450 Swift St., Victoria) from 5:00 PM to 7:00 PM. It will be accompanied by a food tasting featuring products from Market vendors starting at 6:30 PM, followed by a keynote talk from Brent Warner, Executive Director of Farmer’s Markets Canada. The evening will continue with an 8:00 PM screening of Ingredients, a documentary about local food and the farm-to-table movement, and will wrap up with a fundraising raffle for the Public Market.